RAN Station 1 - Port War Signal Station, initially at Cowan Cowan, Moreton Island, then "Buena Vista", Moffat Head, Caloundra, then Wickham Point, Caloundra. INITIALLY AT COWAN COWAN, MORETON IS. 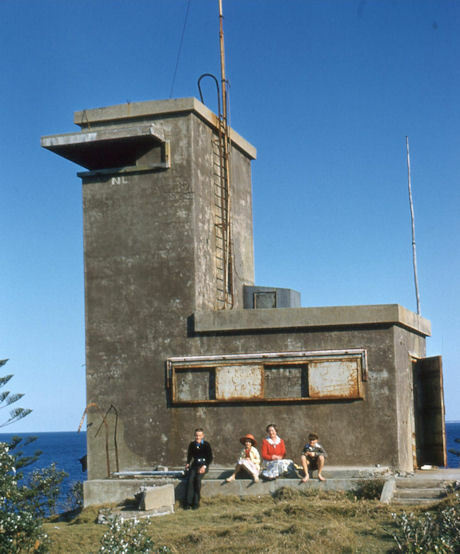 In the early part of WWII the RAN's Port War Signal Station (PWSS) was located at 25 Dorothy Newnham Street, Cowan Cowan on Moreton Island. It was near the RAN's Examination Battery at Cowan Cowan which was built later in 1942 by the Queensland Main Roads Commission. The PWSS was moved to a house called "Buena Vista", in Canberra Terrace, Caloundra on 9 September 1940. "Buena Vista" was commandeered by the Australia Army during WWII and was used as a Coast Artillery Fortress Observation Post. In 1942 the Navy constructed a three storey reinforced concrete building at Wickham Point, Caloundra, near today's Light Beacon at Wickham Point which became RAN Station 1 Caloundra PWSS. Unfortunately this building was demolished in the late 1950's. The front lawn of today's Sea Eagle Units at 38 Victoria Terrace was the site of the Port War Signal Station. Photo:- Mervyn Jones via his son David Jones. 21 July 1942 0225 - After challenge by Port War Signal Station (Caloundra), encountered great difficulty in establishing identity. Created a grave situation in approaching protective devices before being identified. Signal Station ordered ship to stop. Stopped one half mile south of N.W. 1 buoy. Required one hour lying to and boarding ship by Port Examination Officer to clear identity. Pilot vessel almost rammed the S-37, requiring this ship to back emergency and rig the ship for collision. Took pilot on aboard at 0445. 22 September 1942 0545 - Exchanged recognition signals with P.W.S.S. Caloundra Head and received permission to proceed. 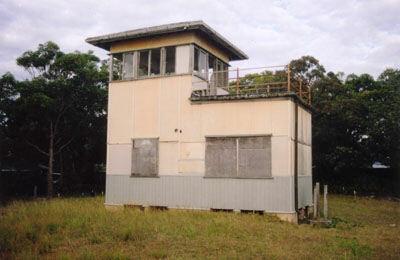 The Extended Defence Officer (EDO) for Fortress Brisbane was based at the PWSS. This Naval Officer was in command of the extended defences of the port. He was responsible for making sure friendly shipping was able to safely enter Moreton Bay and the Brisbane River and that enemy vessels were detected and dealt with. The EDO would pass Naval Intelligence information to the Fire Commander advising him of the presence of friendly vessels. The EDO was responsible for controlling the examination service whereby ships were challenged and examined to ensure they were friend and not foe. He also was in overall control of the various submarine indicator loops and minesweeping operations in Moreton Bay. WRANS worked at Caloundra PWSS. They had their accommodation in Memorial Lane, Caloundra. One of the WRANS was Margaret Hodgson, a Signaller. to their ship HMS Lothian. L to R:- Les Jones, Ron Hunt, "Sam" Samuels, "
Jumbo" Gelling, Tony Gilbey, and Ken Barraclough (kneeling). quarters and offices for the station complement of about 16 all told. Les Jones, a WWII Signalman with the British Royal Navy contacted me in April 2008. 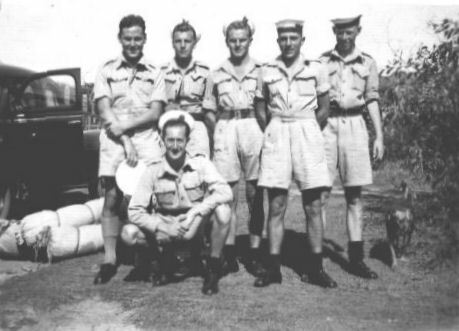 He had been part of a group of visual Signalmen who had spent about three weeks at the Caloundra PWSS in November 1944. The above photo shows them about to return to their ship HMS Lothian, which was a Communication Headquarters, flying a Rear Admiral's flag, part of the RN Fleet Train attached to the US 7th Fleet, carrying British Army and Royal Air Force communications personnel plus other specialists. They had berthed in Brisbane in November 1944. Les told me that the buildings on site where the full complement had their quarters were very compact and had a mess deck adjoining the male quarters and the 'galley' at the rear, with the WRANs in a separate building of course together with a separate office building. The whole site was surrounded by a wire mesh fence. The 'Fleet Train' was comprised of HMS Lothian, a converted merchant ship (previously and later reverted to 'City of Edinburgh' carrying the flag, plus six other former merchant ships and joining others oilers etc., carrying stores of all descriptions to replenish the forward units. In July 1946, the Naval Officer In Charge Brisbane (NOIC Brisbane) wrote to A.C.N.B. (I assume this is someone at the Naval Board) advising that the building remaining at PWSS Caloundra comprised one concrete Signal Tower and one wood fibrolite barracks building on Commonwealth land. 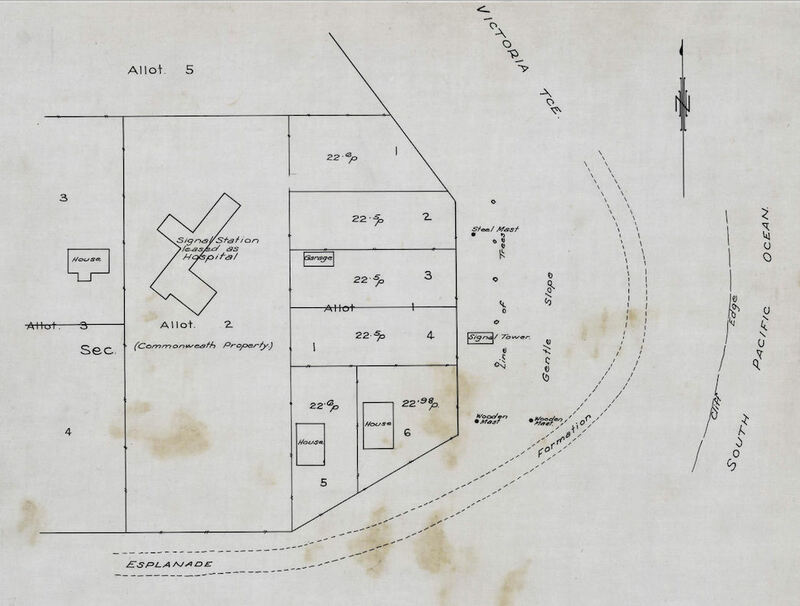 He advised that the Department of the Interior, Brisbane had requested the transfer of both buildings to them on a "Marching In, Marching Out" certificate for caretaking and possible lease to the Incapacitated and Wounded Soldiers Association. NOIC Brisbane, recommended approval for the proposed transfer, otherwise he considered it essential to engage a caretaker for security of the Barracks Building when it was to be vacated on 24 July 1946. A.C.N.B. wrote back stating that the Caloundra PWSS should be destored (?) if not already done and the temporary buildings declared for disposal. Permanent buildings should be locked and arrangements made with the local Police to visit periodically. I'd like to thank Dr. Richard Walding, John Perryman, Les Jones, David Jones, David Spethman and Russell Miller for their assistance with this web page.